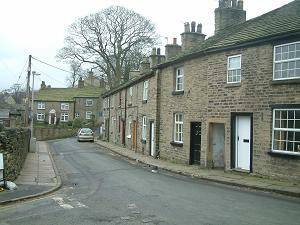 One of the quaintest streets which is actually in Kerridge. 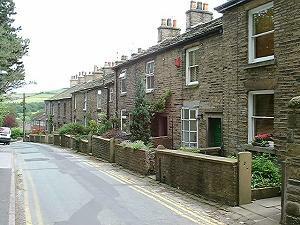 Much of one side at the top is lined with a terrace of stone cottages (below) but there are larger more modern properties towards the bottom of the road. On the other side there are a few larger houses high up on the bank. The top part of the street is very narrow, allowing only single line traffic and no parking. 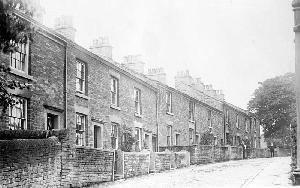 The 100m between High Street and Lord Street (pictured left) contains another terrace of delightful stone cottages with Adshead’s Farm House at the end. New properties are under construction in 2017 opposite these. Approach off Grimshaw Lane, High Street, Lord Street. Leads to Cow Lane and Adshead Court. Footpath to Gleave Avenue. Nearest pubs – Crown Inn, Bull’s Head. Council Ward – North side, Central; south side, East. The top end of Chancery Lane is very narrow. The charming cottages still all have their front gardens with stone walls and gate posts and a sett lined gutter. The same section of street but from the bottom end in an earlier time. The ground on Chancery Lane between High Street and Lord Street is being developed with a terrace of houses. Construction started in early 2016. At the junction with Lord street there was a small brick building with some history – see the Redifussion page. Conservation: This street is in the Kerridge Conservation Area. Numbers 2-24, 3-7, 34-54 and 64 are subject to Article 4 Direction.